A stele monument commemorates the discovery of copper by Hartman, Campbell and Gibb. 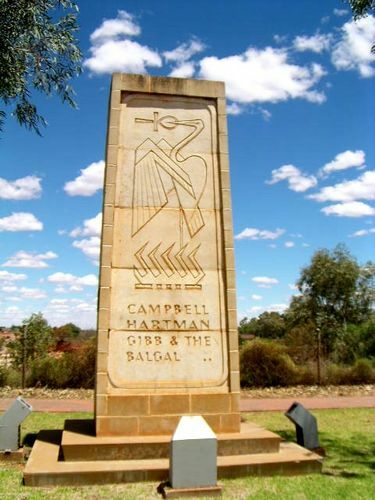 The script on the stele commemorates the "Balgal", Sidwell Kruse, the woman who identified the first copper samples in the Cobar area in 1869. "Balgal" was the traditional name for women employed in Cornish (English) copper mines. These women sorted the mined ore looking for the best pieces to be smelted. A "Balgal`s" job was hard and unrewarding with the women required to shovel and carry heavy loads of ore. Sidwell Kruge`s expertise in identifying the "Kubbar" waterhole samples precipitated the development of the Cobar mining industry.